Palemia, A Memoir is the book of anticipation! A book of events. Events of defining consequence in the life of Samoa. For some, perhaps even a book of revelation! This Memoir is political statecraft at a moment of supremacy. It is a proclamation on deeds and achievements: the Prime Minister’s personal account and viewing of the causes and events of momentous political significance shaping the direction and management of the modern development of the country. In the past few days the Samoa Observer has carried a broad outline of the Memoir and from it I think general indication has been given of what the reader might expect. The past 35 years, the focus of the book, were among the critical years in the experience of a newly-independent island State, and the Prime Minister renders his accounting and historical perspective on a range of key aspects: the realities of nation-building under a largely untested Constitution; the shifts and turns in political leadership; party politics, opposition politics, the maneuvering and intrigues; the personalities of note; political assassination; the public servants strike, seen as a defining moment; the national economy and its modernisation; the response to critics; natural disasters; and the multitude of challenges and accomplishments. There is much here that will generate interest and fascination - and perhaps for some, fortitude in reading of matters past or which might have been left in the past. But, this is not a sales pitch on my part, and I have no wish to risk the theatre-rush for copies and, therefore, I shall leave it to others and refrain from touching on the specifics and the details. What we have in this Memoir are the insights and reflections of a man who has been at the very centre of policy-making and governance for an extended period of time. The perspectives are idiosyncratic and offered from a range of elevated vantage points: as member of Parliament since 1981, having been a senior Government bureaucrat for a number of years; viewpoints from the position of senior Cabinet postings, the first from 1982; following long years of tutelage under the Hon Tofilau Eti, a political grand master; and a personal historical reading of all this as Prime Minister since 1989. There is much in this treasury of intimate engagement, first-hand knowledge and experience from which to draw. More in biographical form, this is also the story of a young boy growing up in the village of Lepa, exceedingly remote and difficult to access in those days, and the determination of his young life to get to where he is today; solidly rooted in family and culture; fixed on purpose and his search for education and advancement, unafraid and undaunted by the obstacles. Those of us of a certain age will understand the circumstances of the country at the time, indeed, will have experienced similar hardships that have conditioned the aspirations and lives of the Prime Minister’s generation. This, then, is a tale of remarkable self-assurance, of high reaching ambition and endeavours, steeped and sustained by deep cultural values and connections. It is a book which offers invaluable inspirations, in particular for the younger generation. There are also matters of obvious closeness to the Prime Minister’s heart, with a charming tribute to his lady, Gillian; an acknowledgement of equality to one, almost always unheralded but so true and unerring in the co-partnership of leadership. The political memoir is a dynamic format and often the favoured literary genre because it is where history and politics are narrated in personalised form. For those in high office and positions of leadership there is a powerful if not irresistible impulse to generate a public record of deeds that would make future generations remember names and accomplishments. Or, as some would say, it is part of the ‘quest to surmount the bounds of mortality’. The title is all too important. Lord Balfour once said of Winston Churchill that he had written a big book about himself and called it The World Crisis. But, of course, in our case, there is pertinence. This is the Memoir of he who, since 1998, has taken monopoly of the office of Palemia for well nigh 20 years; and leader of a political party which, after 35 years and following a 94% sweep at last year’s elections, is now in undisputed political dominance. The Memoir remarks on the astounding results of the 2016 elections and the now unique challenges to effective democratic governance, with a Parliament of chiefs without opposition and need for political management of sizeable back-bencher numbers. The implications of an overwhelming majority especially for the sovereignty of the Constitution and the easy temptation in altering its provisions would be a particular concern. The Constitution is not an ordinary statute after all, but supreme law with special character. I was a bureaucrat contemporary of the Prime Minister in Government service and I have some familiarity with some of the key events recounted. (And I have my own memories.) I must say that it has been a particular honour to serve him as Prime Minister, as it has been a special privilege for me, and I should think, a diminishing number of other colleagues, to have served every Prime Minister of our country since Independence. When contemplating my career move to international judiciary I informed the Prime Minister of the high-level competition and huge task that faced me and our small country. His encouragement was unwavering, and he was fatherly. ‘Humanity and justice lie in your heart’, he said, and remember always that you are a Samoan. So armed, and somewhat like the Manu Samoa, I went forth. Years later, on my return to the region, he telephoned to say that the Government was thinking of proposing me as Secretary General of the Pacific Islands Forum. I said I was deeply honoured, but would appreciate time to consult my wife. ‘Is that necessary’ was the immediate come-back! Again, I thought to myself, who am I to challenge decisive leadership! Let me say that it is a matter of immense pride for every Samoan to observe the Hon Prime Minister and the high estimation he commands internationally. Whether in the halls of the United Nations, the high table of the Commonwealth or among Pacific leaders he is listened to closely and well acknowledged for his long experience and clear viewpoint. Acknowledged also for his way with famous women! As recounted in this book, who else would be sought out in Rio de Janeiro by Hilary Clinton and kissed and hugged while so many world leaders looked on? This Memoir is wide in coverage, and there is a large list of characters. But not every event and not all are named. Each of us concerned would have to figure out the implications. Omission, or the feeling of being neglected, might sometimes be more grieving. In Gordon Brown’s post-prime ministerial memoirs Tony Blair’s name was notable by its loud and total absence! The Prime Minister has noted that it is a little unusual to be publishing his memoirs while so many other actors are still active. If that be open invitation to such actors or, if in that there is hint of a second volume to come, then there would be cause for those with contesting memories to start lining up outside Dr Swain’s door. 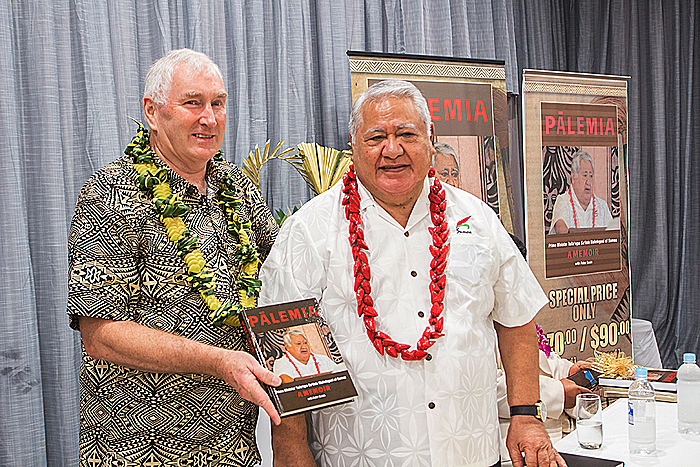 Dr Peter Swain has been spoken of – and already spoken for – by no less than our own, the Hon and distinguished Professor Luamanuvao Winnie Laban. Though we now know that Peter had cast the acorn seed for this memoir, his admiring co-authorship is that of the trained scholar and professional, and the presentation of this work and his informed commentary add substantive measure to this important Memoir. And, so ladies and gentlemen, we now have the personal memories and reflections of the Prime Minister, carefully recalled and assembled in this Memoir. The singular merit of the Palemia memoir is that we now have it in our hands in recorded form. It does not pretend to be the definitive history. Yet, history is written. It would seem to me that, at least for the moment, it has claimed a place of its own, in the Samoan politics of memory. Henry Wadsworth Longfellow in his poem A Psalm of Life, suggested that our real destiny is not enjoyment, and not sorrow, but, in the words of the poet, “to act, that each tomorrow/Find us farther than today.” In our salute i Lana Afioga le Ali’i Palemia for this memoir I’m sure you would wish to join me in a warm fa’amalo and to thank him for having so acted, for all these years, for all of us.